I can’t tell you a thing about wheat. I might consider this an embarrassment considering I live in a state where the landscape is dominated by wheat fields. At least, that’s what I think they are. See where I’m going with this? I don’t know Jack about agriculture! I recognize sunflowers because…c’mon, who wouldn’t??? I also recognize corn because I grew up in the Midwest and it is tradition for parents to torture their children by forcing them to detassel corn during their teenage years. 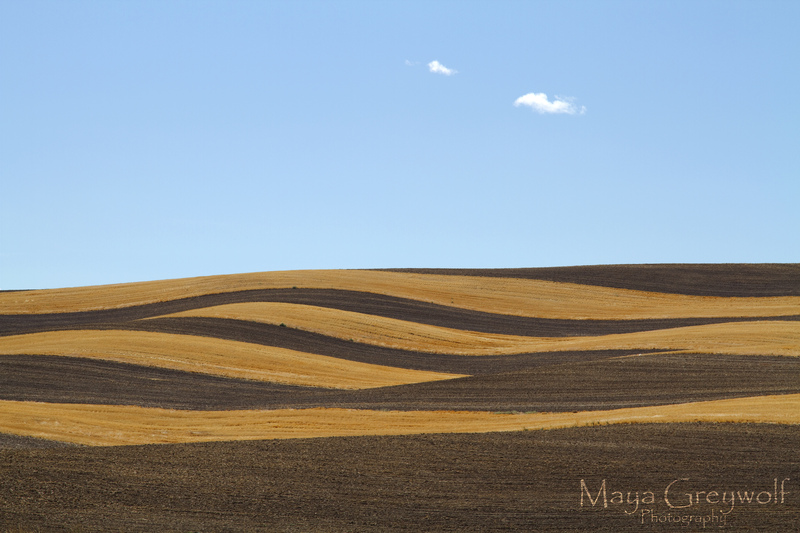 I’m assuming this is a wheat field because it was in eastern Washington and I’ve been told there are a lot of wheat fields there. What I don’t have to assume, is that art is everywhere; it simply takes different forms for different folks. Out – friggen – standing! Whatever crop it is. Hey, I got lost on the families home quarter in Saskatchewan. I’m a bush, mountain, ocean kinda guy. That flatness freaks me out, but this, this is beautiful. Having lived in Alaska much of my life,I am a trees and mountain-loving woman! During one of my migrations across the high plains, I was lamenting over the lack of vegetation and diversity of environment. Then it hit me that, in some ways, it looked like the tundra of home and in an instant, it went from painfully boring to intimately beautiful. I was trying to think of something deep and profound to say about this photograph, but maybe it’s better to just say what I first thought. That it, it’s beautiful, it’s perfect.